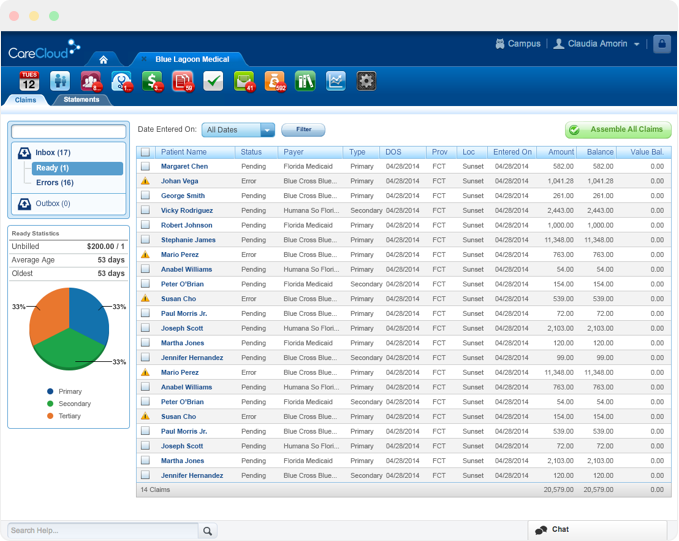 Track, manage and optimize financial and administrative processes with modern practice management software. CareCloud Central is a medical practice management solution that boosts productivity by automating the day-to-day tasks that can slow an office manager down. 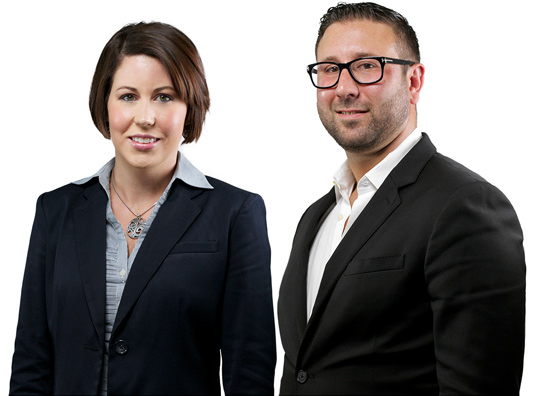 Central delivers much more than medical billing software. Sure, it has the tools to help generate cleaner claims and reduce denials, but our easy-to-use practice management software also streamlines your workflow to deliver seamless handoffs across departments. Central becomes your practice’s command center, delivering robust, real-time analytics through customizable reports and dashboards to ensure you know how your business is performing on the metrics that matter most. Easily manage your practice’s schedule with our multi-view calendar and drag-and-drop online patient appointment scheduling. Front-desk staff are empowered with modern patient scheduling software that makes it easy to book and confirm appointments across locations, verify insurance eligibility in advance, and quickly check patients in and out. Your practice will maximize efficiency with smoother handoffs across the team and reduce patient no-shows with automated patient reminders, so you can make the most of your day. Central gives your front-desk staff extremely powerful — yet easy to use — scheduling capabilities to manage your busy workday. Easily book and confirm appointments, check-in and checkout patients, and view past, present, and future schedules across multiple providers and locations — daily, weekly, or monthly. 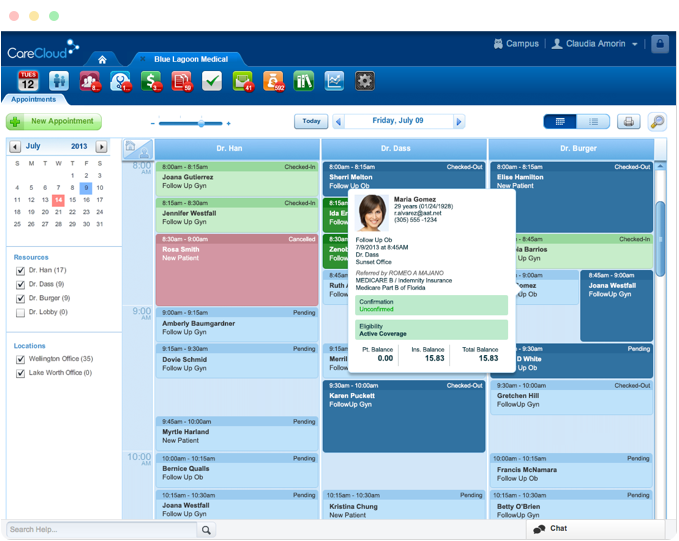 Drag-and-drop capabilities combine with rich, color-coded views to make scheduling fast and intuitive. Verifying insurance eligibility is easy with CareCloud Central. Quickly check a patient’s insurance details — deductibles, co-payment and co-insurance — or schedule batch checking overnight, with just a few mouse clicks. The result? Fewer denials downstream, so your practice gets paid faster. Remind patients of their upcoming appointments, so you can minimize no-shows and maximize revenue. Our intuitive workflows allow you to easily send text messages, emails or phone call reminders to confirm patient appointments. Get a complete, well-organized picture of your patients all in one place with the ability to easily view and update patients’ demographics, insurance details, and account histories. You can also attach files, so you keep everything together — reducing paperwork and saving time. Plus, if you use our EHR, you can also view clinical information consolidated neatly in this app. Central’s web-based medical billing software takes the guesswork out of financial performance, so you can run a more efficient business. Innovations like CollectiveIQ, our collection of advanced automated billing rules—embedded in Central’s claims workflows — help you avoid costly errors, minimize re-work, and get paid faster. And, for those unavoidable denials, Central’s powerful collections capabilities help you quickly take action so revenue doesn’t slip through the cracks. Plus, spot financial trends early with the industry’s most advanced analytics delivering real-time insight into your practice performance. Simplify coding and charge entry, while avoiding costly mistakes with Central’s Billing app. It takes the stress out of preparing claims by auto-populating fields and providing built-in tools like diagnosis and CPT code lookups. An advanced collection of billing rules and real-time error alerts are built into the workflow to prevent mistakes, so you can prepare claims quickly and accurately. Get paid faster and spend less time chasing down payments by sending cleaner claims. After you post charges in the Billing app, this app applies up-to-date billing rules to identify issues before submission, so you get more claims paid on the first attempt. When claims are ready, you simply move them to the app’s outbox for automated nightly submission. Keep accurate track of your payments and spot issues fast with a central remittance repository. Central features comprehensive capabilities that automatically post electronic remittance advice (ERAs) to patient accounts, while providing you with an easy, seamless way to scan and process paper-based explanation of benefits (EOBs). With all of these stored and linked to specific patients, you maintain full account histories and can quickly pull up details when patients have questions. Managing insurance payments and following up on denials has never been easier than with CareCloud Central. Central automatically moves denied claims into this app and goes a step further by indicating the reason for each denial. Claims without responses also automatically appear in this app after a period of time, so you can follow up with payers. Powerful capabilities allow you to isolate payer denials and no-response claims — by payer, age, denial reasons and more — giving you immediate visibility into the status of claims across your organization. Easily store the payment structures and specific terms of your individual payer contracts in the Contracts app. Once the information is in the system, apply the terms to charges so you can effortlessly spot and react to underpayments and overpayments. No matter what type of organization you’re in, data is critical to running a successful business. With CareCloud Command Center, our intuitive practice scorecard, it’s easy to keep a pulse on your practice’s key performance indicators, so you have greater control over results. Command Center provides an instant snapshot of the metrics you care about most–both operational and financial–so you know how they’re trending and what’s influencing them. 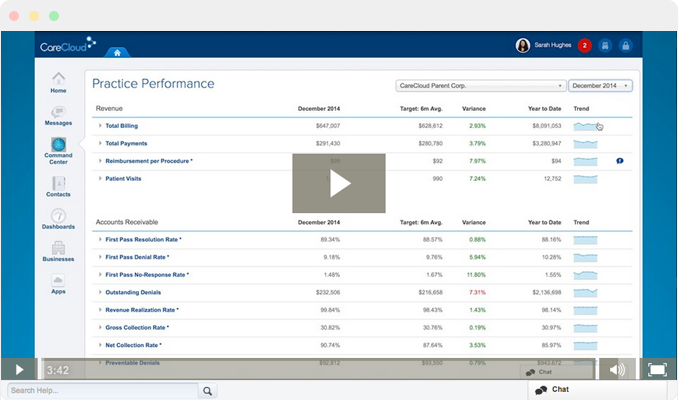 Plus, you can drill down quickly to see metrics over time, by location, by provider and more. With effortless access to your data, you’re always in command. Get powerful insights into your practice and make more informed decisions with Central’s customizable, easy-to-interpret dashboards and reports. 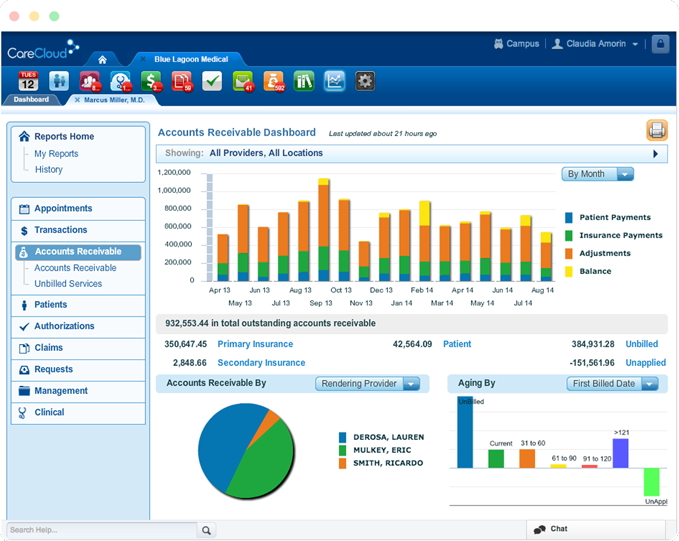 Robust analytics deliver your practice’s financial, administrative and clinical performance through interactive charts and graphs. View staff productivity levels, days in accounts receivable or how you’re performing against Meaningful Use objectives anywhere on the industry’s most modern cloud-based analytics software. It’s your business data, delivered the way you want it. CareCloud offers Campus — a customer education and training portal — that provides users with a hands-on way to get the most our of their CareCloud experience. Within this vibrant peer community, providers and practice managers can get their questions answered from CareCloud experts and share tips and tricks with other community members. With access to a rich array of content including online training videos, product release notes, and Meaningful Use help guides, it’s a great place to learn. From constructing your practice in the cloud to configuring the system to enable billing for your specific payers, CareCloud’s Professional Services team ensures your transition is smooth and swift. Your Implementation Specialist oversees the whole process, so you have a single number to call with questions. CareCloud’s Internet-based system is awesome. If I need to look up anything, I can just go to my computer and look it up there. No more chasing down files – I love the accessibility…I [also] love the freshness of CareCloud. I have to look at a computer all day and it is very easy on the eyes. CareCloud’s refreshing approach to solving the problems we face on a daily basis has eliminated the chores of managing my practice and allowed me to focus on my patients instead. Multi-tasking without losing what you are working on in a different screen has made my life so much easier.